Besotted with chard, of all things, I joined the long line at the Lost Creek Farm stand last weekend. Who could resist? But wait…of all the spring greens, chard is my least favorite. I dislike the leathery texture of the leaves and the muddy aftertaste that often accompanies the cooked product. But I had tasted chard stem pickles, and I was on a mission. When I saw the giant bunches of chard with their long, gorgeous stems as long as a baguette, I knew the moment had come. Don’t throw those chard stems away! Chard stems, julienned into matchsticks that are as tall as the jar in which you’re pickling them, can be quick-pickled in the refrigerator. 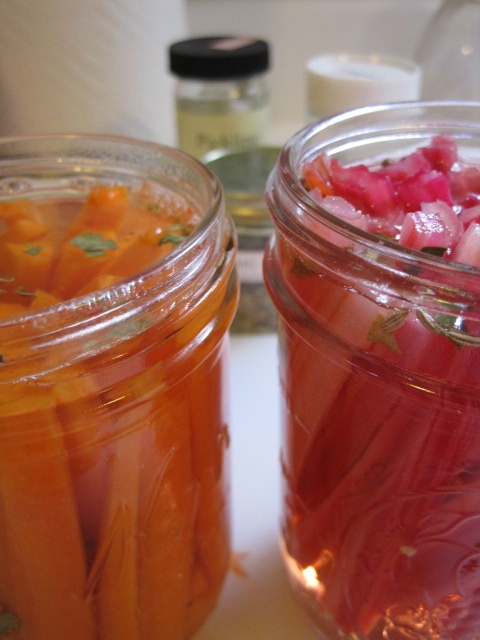 You don’t need any special canning equipment, just a refrigerator and time. Do use a freshly washed container that can withstand boiling brine (e.g., tempered glass or plastic, non-corroding metal). What do they taste like? Nothing you’ve ever had. Try this. Eat a bit of raw chard stem. See how it’s kind of crunchy, kind of watery, and kind of fresh? Now imagine it actually tasting good — exploding in your mouth with vinegar and spices. That’s what a chard stem pickle tastes like. This recipe makes enough brine for two pint jars. I made one pint of chard stems and one of carrots. Both were delicious. Since they’re refrigerator pickles, you can experiment quite a bit. Onions? Fennel? Brussels sprouts? Daikon? Tiny Turnips? Name your poison. This recipe is adapted from one circling the internets from Gramercy Tavern in New York. I rearranged the ratio of water and vinegar, and changed the vinegar from rice wine, which I find very harsh, to the more mild and complex white wine vinegar. I particularly like fennel seed in this pickle, so I make my own spice mix. Don’t omit or reduce the sugar, since it adds an important balance to the vinegar. The pickles don’t really taste sweet at all. I tried to make fermented chard stem pickles, too, but after five days they’re just barely bubbling and have turned a horrid mauve. They taste like muddy, salty, waterlogged chard stems. So stick with the refrigerator pickles. Trim the leaves off the chard stems. Rub the stems under running water to remove all traces of mud. Julienne the stems, creating batons that are almost as long as the height of your jar and rather thin so they’re delicate, not formidable. The shape really makes an impact on the edibility of these pickles. Place half of the spices in each of the jars. 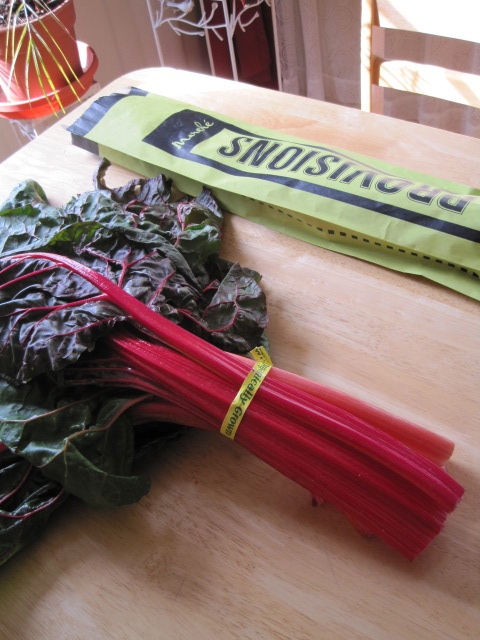 Pack chard stem batons as tightly as possible into the jars. Pour boiling brine in jars. Let sit on counter until cool, then refrigerate for at least a few hours before eating. Pickles will keep with excellent quality for about a week. Oh, NO! 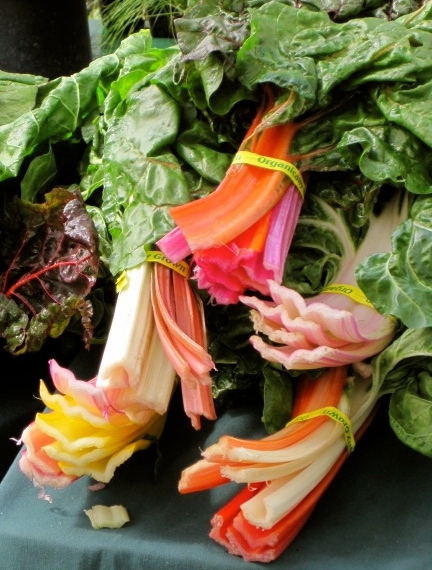 Spring chard is a miracle of nature! I just cooked up a nice pot of it the other night – to much delight. Best part is drink – elixir of chard steam – that is produced in the bottom of the cooking pot! Chard is pretty and therefore I like it. Ha, I love chard in a variety of forms (though REALLY REALLY not overcooked), but I’m damn sure going to make these pickles anyway. Bonus for me will be the chard leaves for saag or stir-frys or whatever else I want. If you ever don’t want your chard leaves, take the stems and I’ll trade you … something. Brandy pecan sauce, perhaps. I tried fermenting it and it was not appealing at all. I wonder if adding a horseradish leaf would prevent it from getting soggy, but of course, the horseradish is barely up yet. I’ll try this quick pickle. @Suzi: Saag from chard sounds very good to me. I’ll try that this week.